Solve inequalities using a number line. Solve 2X2 systems of linear equations using substitution, linear combination, and Cramer's Rule. Flash update file to update the ROM of the HP 39gs to version 2.22. This is the official HP release. Flash update file to update the ROM of the HP 40gs to version 2.22. This is the official HP release. Extends PDL to accommodate the new 48G/GX commands by placing the HP48G.CMD file provided here in your PDL directory. Reasonably good quality photo of the HP 49G. Experiment showing how the Prime can be used with the HP StreamSmart 410 and a light sensor to measure the frequency of a fluorescent light. Unfortunately it incorrectly claims that electricity in the US runs at 120 Hz; this misunderstands that AC has two peaks per period (in opposite directions), both of which cause the light to get brighter. Also has useful information on how to export data from Excel to the Prime. Investigate rigid transformations of seven basic functions: y=x, y=x^2, y=x^3, y=|x|, y=x, y=1/x, and y=1/x^2. Advanced User's Reference Manual for the HP 49g+ and HP 48gII. This is essentially the AUR from the HP 48G series updated for the 49 series, documenting all commands in the 49 series and filling 653 US Letter pages. Internally linked by Bruce Horrocks. There is an updated version, Edition 2, available elsewhere on this site which covers the 50g. Investigate the parameters A and B to see how they effect the functions y = Asin(Bx), y = Acos(Bx), y = Atan(Bx), y = Asec(Bx), y = Acsc(Bx), y = Acot(Bx). Solve for the missing angle given a pair of complementary angles, a pair of supplementary angles, or a triangle. Convert your HP 38G standard aplets to use in an HP 39/40G. Warning: the aplets must have been created either with the HP 38G ADK or directly on the HP 38G. Windows program for developing HP 38G aplets. Supports personal time management on the HP 48. You can scroll through dates presented in calendar format, and then view, add, edit, delete, or acknowledge appointments or reminders for the selected date. Appointment manager program. Improved version of HP's original program, as it is faster and smaller with the same functionality. A 14-page PDF introducing HP PPL programming on the Prime, including examples with the Sierpinski Triangle and Sicherman Dice. Explore Archimedes' method for approximating the value of pi by comparing the area of a regular polygon to the area of the corresponding circumscribed circle. Multiply first degree monomials and binomials. Explore stretches, shrinks, and translations of seven basic graphs. Explore relationships among the different data to investigate different cars, the cost, mpg, etc. Keeps the system clock as accurate as possible by synchronizing the clock with a time standard, and using the accumulated adjustments with the elapsed time to compute the necessary correction amount/rate. Full documentation from the HP Prime command tree help, extracted into a 188-page PDF document for easy reading and searching. From ROM version 13217. Investigate the conic sections in general and in standard form. Investigate the polar form of the graphs of the conics to discover how changing the eccentricity and distance from the focus to the directrix effects the graph of the conic. Windows program to connect to a high speed Xmodem server on HP-48 or HP-49. Server for HP-48 included. Includes help files. Upgrade to HP 49G Xmodem Connectivity Kit 1.x This is the connectivity package included in Debug4x. Find the midpoint, distance, and slope of a given line segment. Early beta version of a software development kit for writing System RPL and assembly language software for the HP 49. Includes two emulators. For Windows 95/98/NT. This has been superseded by Debug4x. HP 48/49 Software Development Kit (SDK) v2.2 (v1 was called debug2). Windows program with colored syntax highlighting editor, stack pictures, System RPL and User RPL verb completion, HP compiler, assembler, linker, interactive debugger, Inform Box Designer, Emu48 emulator and full help files. Good examples and large help files. v2.2 adds 48gII/49g+/50g support. Source Code for the Debug4x Development kit and the Conn4x XModem Link software. Requires Borland Delphi 6 (Object Pascal) to build. Explore patterns and symmetry by ordering pairs of digits from the decimal expansion of certain fractions that have periodic decimals. The HP 49's built-in demo separated by language to take less memory. Explore points, slopes and equations of lines that enclose the figures. It is also possible for the student to investigate the piecewise functions that would create the exact drawing. Explore relationships among the different data to predict the percent of iron in a given sample. Graph functions where negations and absolute values are applied to the function and its inputs. YorkeM 39 with an HP 39G/40G beta ROM and KML script/bitmap for emulating the HP 39G/40G in Windows. The official HP 39 entry points list and header file for System RPL. To be used with the HPTools. Enables you to print a graphics object on an Epson serial printer, such as the FX-80 and FX-85 printers. Contains the old Equation Library and Periodic Table libraries from HP's Equation Library card for the 48SX, ported to the 49g+ and 50g. The Equation Library libraries are the same as those included with ROM 2.08 and higher, and are included here in case they are accidentally deleted from the calculator. Contains the old Equation Library and Periodic Table libraries from HP's Equation Library card for the 48SX, ported to the 49g+ and 50g and translated into Spanish. Extraction of the original source code for the equations in HP's equation library, including a key to the crude compression algorithm used to reduce the memory usage. Also includes all the graphics extracted as PNG images. Potentially useful for programming your own equation library. This application is designed to aid students in the exploration of calculus and pre-calculus mathematics. Provides a simple interface of the 48S plotting program to act more like the G series plotting program. Symbolically factor second degree polynomials in the form Ax^2+Bx+C. HP's Flash Download Program for updating the HP 49G's ROM under Windows 95/98/NT/2000. This is included in the HPComm package but I have included it standalone for those who want to update their ROM without installing HPComm. Determine an approximation for the golden mean using the ratio of width to length of the sides of the golden rectangles. 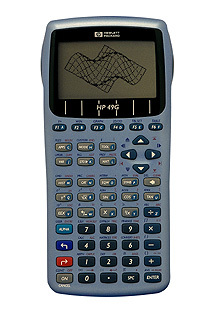 Turns your calculator into a four function RPN machine that handles fractions graphically. Also works with mixed numbers, including GCD and LCM. Bugfix for the broken XRECV command in early 48G/GX ROM versions. Lists how to get the RAM address of some supported entry points common to both the S series and G series. Source code for the free System RPL and assembly language development kit covered by the GNU Public License. Should compile under most operating systems. DOS binaries for the free System RPL and assembly language development kit covered by the GNU Public License. Includes the required Cygnus Runtime Library. Linux ELF binaries for the free System RPL and assembly language development kit covered by the GNU Public License. Win32 binaries for the free System RPL and assembly language development kit covered by the GNU Public License. Includes the required Cygnus Runtime Library. Windows-based screen capture program for the HP 48. Works pretty well! Converts an HP 48 graphics object (GROB) into a TIFF (Tag Image File Format) file. Write the equation of a rational function given horizontal and vertical asymptotes and a root. Write the equation of a line in slope-intercept form when given two points. The Program Development Link provides an on-screen programming environment for developing HP 48 applications. As you develop an application, you can send part or all of it to the HP 48. There each object in the application is stored in an HP 48 variable. You can then run the application on the HP 48 - or you can operate the HP 48 from your computer. Revision 1BB ROM dump of the HP 28C calculator for use with the Emu28 emulator. Revision 1CC ROM dump of the HP 28C calculator for use with the Emu28 emulator. Revision 2BB ROM dump of the HP 28S calculator for use with the Emu42 emulator. The DEMO command from the HP 38G ported to the HP 48. It works on both S and G series. The DEMO command from the HP 38G ported to the HP 49G. Hewlett Packard's supported entry points for the HP 38G in formatted Adobe PDF format. Hewlett Packard's supported entry points for the HP 38G in ASCII text format. April, 1995, press release announcing the introduction of the HP 38. Revision A ROM dump of the HP 38G calculator for use with the Emu48 emulator. ROM image from the 39G/40G suitable for using with Emu48. User's guide for the HP 39/HP 40. In PDF format. The DEMO command from the HP 39/40G ported to the HP 48. It works on both S and G series. The DEMO command from the HP 39/40G ported to the HP 49G. High-resolution photograph of an HP 40gs. Allows you to transfer data between your calculator and your PC with Windows 98/ME/2000/XP. With this tool, you can archive files on for safety, edit programs, text, or numbers on your PC before sending them to your calculator. Goodies Disk 4, with Hewlett-Packard's System RPL development package for DOS PCs. It includes an RPL compiler, a Saturn assembler, a library builder, and more. This document gives HP 48 hardware information required to connect serial devices to the wired (serial) I/O port or to communicate with the HP 48 via the 2-way infrared (IR) I/O port. In PDF format. Software development tools for the HP 48. Includes an RPL compiler, a Saturn assembler, a library builder, and more. Revision K ROM dump of the HP 48GX calculator. HP graciously began allowing this to be downloaded in mid-2000. Revision L ROM dump of the HP 48GX calculator. HP graciously began allowing this to be downloaded in mid-2000. Revision M ROM dump of the HP 48GX calculator. HP graciously began allowing this to be downloaded in mid-2000. Revision P ROM dump of the HP 48GX calculator. HP graciously began allowing this to be downloaded in mid-2000. Revision R ROM dump of the HP 48GX calculator. HP graciously began allowing this to be downloaded in mid-2000. Program for DOS which does an animated demonstration of the 48SX. Contains all the example programs from the HP 48SX Owner's Manual. Revision A ROM dump of the HP 48SX calculator. HP graciously began allowing this to be downloaded in mid-2000. Revision B ROM dump of the HP 48SX calculator. HP graciously began allowing this to be downloaded in mid-2000. Revision C ROM dump of the HP 48SX calculator. HP graciously began allowing this to be downloaded in mid-2000. Revision D ROM dump of the HP 48SX calculator. HP graciously began allowing this to be downloaded in mid-2000. Revision E ROM dump of the HP 48SX calculator. HP graciously began allowing this to be downloaded in mid-2000. Revision J ROM dump of the HP 48SX calculator. HP graciously began allowing this to be downloaded in mid-2000. Copy of the demo library included on the HP 49G, for those of you who may have deleted it. Emulator of the HP 49G for Windows 95/98/NT/2000, including ROM 1.18 and a prototype emulator face. Sometimes the screen turns black when you run it, so right-click and restart the emulator engine. It is recommended that you use Emu48 instead of this emulator. Photo of the HP 49G next to its overhead projector LCD screen. Photo of one HP 49G linking to another HP 49G. Large photo of the HP 49G. Even larger photo of the HP 49G (same as above but bigger). Photo of the HP 49G in its case next to its retail box. 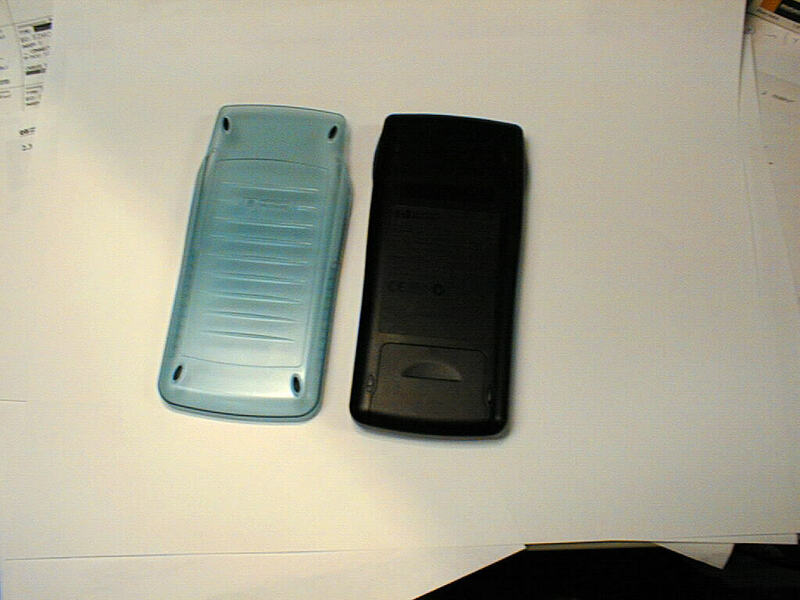 Photo of the HP 49G's slide-on case and back of the calculator case. 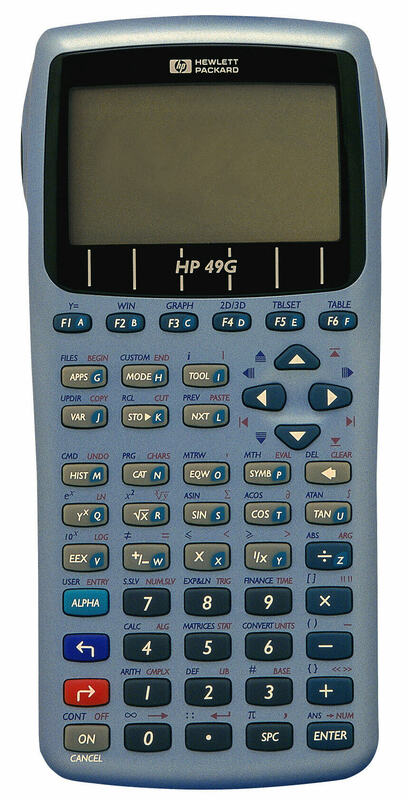 Promotional datasheet about the HP 49G. In Adobe PDF format. Animated GIF version of the demo library included with the HP 49G. Small photo of the face of the HP 49G. Four page document describing some features of the HP 49G, including screenshots. In Adobe PDF format. This contains the 80 page Pocket Guide for the HP 49G. In Adobe PDF format. This contains the 80 page Pocket Guide for the HP 49G, modified to facilitate duplex printing. In Adobe PDF format. This contains the 80 page Pocket Guide for the HP 49G, modified with bookmarks and different orientation to facilitate reading on-screen. In Adobe PDF format. This contains the 235 page User's Guide for the HP 49G. In Adobe PDF format. This contains the 129 page User's Guide for the HP 49G. In Adobe PDF format. Comparison of features between the HP 49G and the Casio CFX-9970 and Sharp EL-9600. In Adobe PDF format. Comparison of features between the HP 48G series and the HP 49G. In Adobe PDF format. 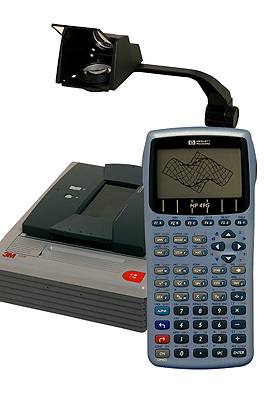 Comparison of features between the HP 49G and the TI-89. In Adobe PDF format. Early beta version of a program to connect a Windows computer to an HP 49G with the high-speed Xmodem server. Fully bookmarked version of the complete (862-page) HP 49g+ User's Guide. In Adobe PDF format. 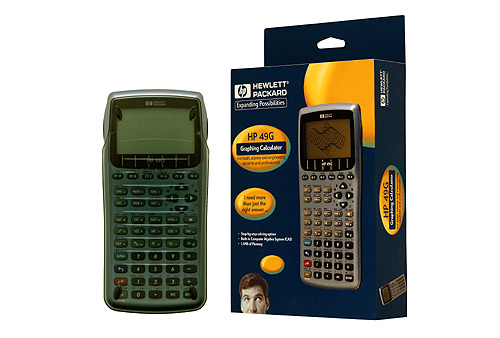 Complete 176-page HP 49g+ User's Manual, as shipped with the calculator. In Adobe PDF format. Advanced User's Reference Manual for the HP 50g, HP 49g+ and HP 48gII, though also applicable to the HP 49G. This is essentially the AUR from the HP 48G series updated for the 49 series, documenting all commands in the 49 series and filling 693 US Letter pages. Also available in printed form. Contains 56 training aids to help engineers and scientists, students and educators, business and finance professionals, and real estate professionals to better use the HP 50g. Includes contributions by various members of the HP calculator community. Complete English-language 887-page user's guide for the HP 50g. Complete English-language 184-page user's manual for the HP 50g. A printed version of this manual is included with the calculator. Similar to the official "HP 50g, 49g+ and 48gII PC Connectivity Kit" build 2439, this version has somewhat better timing. It also has a "Log File" to help diagnose connection issues. Allows you to transfer data between your calculator and your PC with Windows 98/ME/2000/XP. With this tool, you can archive files on for safety, edit programs, text, or numbers on your PC before sending them to your calculator. 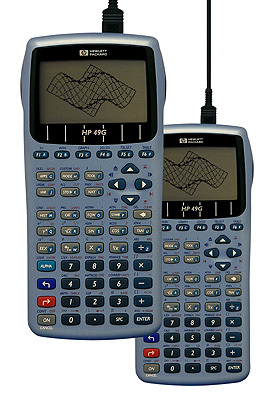 The connectivity kit is also the tool that will allow you to update your HP 49g+/50g ROM with the latest version of the software and to download applications to your calculator. Also includes USB drivers for 32-bit Windows; HP USB Drivers for 64-bit Windows are available separately. This is the successor to Conn4x. Various ROM images useful when emulating the HP 71B. Windows-based software for connecting to the HP Prime calculator. Now includes Apple Bonjour installer to enable mDns networking on Windows. Updated to use 2017 build tools and redistributable packages. Windows-based software for connecting to the HP Prime calculator. Now delivered as a 64-bit version by default. Now includes Apple Bonjour installer to enable mDns networking on Windows. Updated to use 2017 build tools and redistributable packages. HP Journal article from June 1996 on the HP 38G in Adobe PDF format. Copyright Hewlett Packard, distributed with permission. This is Hewlett Packard's own periodic table of elements library for the 48G series. A comprehensive 21-page PDF introducing teachers of Algebra 1 and Algebra 2 to using the Prime and the Prime Wireless Network, following the themes of the power of visualization and looking for patterns. Includes identity graphing, systems of linear equations, infinite series, powers of a binomial, the Sierpinski Triangle, and solving trigonometric equations. A comprehensive 65-page PDF explaining how to best use the Prime in an AP Calculus class. Includes lots of screenshots and detailed step-by-step directions. A comprehensive 64-page PDF explaining how to best use the Prime in an AP Statistics class. Includes lots of screenshots and detailed step-by-step directions. Promotional two-page data sheet advertising the Prime. Promotional two-page data sheet, translated into German, advertising the Prime. Firmware update file for the HP Prime. TrueType font for the keys of the HP Prime, useful for making documentation. Font for the keys of the HP Prime, useful for making documentation, for use with TeX/LaTeX, including a configuration script and an example. Firmware update file for the HP Prime running G2 hardware. HP Prime Graphing Calculator Quick Start Guide, the 52-page PDF full document included in printed form with the calculator. HP Prime Graphing Calculator Quick Start Guide translated into German, the 81-page PDF full document included in printed form with the calculator. A set of PDFs explaining how to do various statistical operations on the Prime. Aimed at AP Statistics students. HP Prime Graphing Calculator User Guide, the 761-page PDF full document included on the CD with the calculator. Emulator (technically a simulator, since it is a native PC program) of the HP Prime Graphing Calculator for Windows. Lets you do everything the calculator does, but with the full control of your keyboard and mouse and taking full advantage of your PC's computing power. Now includes Apple Bonjour installer to enable mDns networking on Windows. Updated to use 2017 build tools and redistributable packages. Emulator (technically a simulator, since it is a native PC program) of the HP Prime Graphing Calculator for Windows. Lets you do everything the calculator does, but with the full control of your keyboard and mouse and taking full advantage of your PC's computing power. Now delivered as a 64-bit version by default. Now includes Apple Bonjour installer to enable mDns networking on Windows. Updated to use 2017 build tools and redistributable packages. Emulator (technically a simulator, since it is a native PC program) of the HP Prime Graphing Calculator for MacOS. Updated to use 2017 build tools and redistributable packages. Contains many of the tools in the HP 48 Software Development Tools package, but leaves out some of the less necessary files (including Kermit) to reduce the file size. FreeBSD pkg_add installation file for the free System RPL and assembly language (HP syntax and MASD [Meta Kernel] syntax) development kit. In elf format for FreeBSD 5 x86. Source code available on the FreshPorts site. Linux RPM installation file for the free System RPL and assembly language (HP syntax and MASD [Meta Kernel] syntax) development kit. In elf format for Linux x86. Win32 binaries for the free System RPL and assembly language (HP syntax and MASD [Meta Kernel] syntax) development kit. Should run under Win95, 98, ME, NT, 2000, XP. Source code for the free System RPL and assembly language (HP syntax and MASD [Meta Kernel] syntax) development kit. Should compile under most Unix systems (including Cygwin) and Microsoft Visual C++. Updated USB drivers for connecting a Windows computer to the HP 50g, 49g+, 48gII, 39g+, 39gs, and 40gs. Supports both 32-bit and 64-bit Windows XP, Windows Vista, and Windows 7. Press release from 65 Notes (July 1975, V2 N6 P7) announcing the use of the HP-65 in space. Allows you to print to a Hewlett-Packard PCL printer with the 48S/SX/G/GX. Black and white outline of the 49G including its keyboard layout. Contains the 112-page Advanced User's Reference, the 72-page CAS Command Reference, and the 360-page Command Reference. In Adobe PDF format. This document gives comprehensive information about communicating with the HP 82240B infrared printer. In PDF format. HP 48/49 link kit for Windows 95/98/NT/2000, with an easy-to-use Explorer-like interface. Included with the HP Graphing Calculator PC Connectivity Kit and under the GPL. Tarred and bzipped GPL source code for HPComm. Tarred and bzipped GPL source code for HPComm38. HP 38/39/40 link kit for Windows 95/98/NT/2000, with an easy-to-use Explorer-like interface. Graphically solve a system of linear inequalities. Receives printer data from other HP calculators via the IR port and saves it as a string. Documentation for HP's RPL compiler for MS-DOS. Explore inverse relations and functions. Analyze relations and functions graphically, numerically, and symbolically. Solve oblique triangles by applying the laws of sines. Apply the laws of exponents to multiply and divide monomials and to raise a monomial to a power. Lists the original rules for assignment of library numbers. Identify the slope and the y-intercept given a linear equation, and will describe the various effects positive, negative and zero values have on the graph. Graphically solve a linear inequality. Macintosh connectivity software for use with the HP 48. Included with Hewlett Packard's serial interface kit. Documentation for MAKEROM from Goodies Disk 4. Has a lot of useful information on creating libraries that's applicable for other library creators, too. Investigate the relationship between the unit circle and the graphs of y=sin x and y=cos x. In progress version of the documentation for MASD, the assembly language and System RPL development software in the 49. Now covers the version included with the 49G+, including ARM development. In both Adobe PDF and Word format. In progress version of the documentation for MASD, the assembly language and System RPL development software in the 49. In Adobe PDF format. Solve systems of equations using Gauss-Jordan elimination. The student will algebraically manipulate the matrix to put it in row-reduced echelon form (RREF). The Minehunt game from the 48SX equation library card and the 48GX, extracted to run standalone on the S series. The classic Minehunt game now for the HP 38G. The HP 48G MINEHUNT command ported to the HP 39/40G. An exact replica of the Minehunt game, included in the HP 48G series, now for the HP 49G. A more accurate version of the ->Q command. When a binary object received by Kermit on the HP 48 is left as a string beginning with HPHP48, OBJFIX will extract the HP 48 object if the only problem is that extra bytes got appended to the end. Explore the relationships among voltage, current, and resistance. The ideas of Ohm's law and power will also be explored. Simplify expressions using the order of operations. Write the equation of a line parallel or perpendicular to a given line through a given point. Write ratios that will solve problems of the form A is B% of C.
Explore the four different parameters that effect the graph of y=Asin(BX+C)+D and/or y=Acos(BX+C)+D, and will be able to analyze these symbolically and graphically. Investigate the parameter C to see how it effects the functions y = sin(x+C), y = cos(x+C), y = tan(x+C), y = sec(x+C), y = csc(x+C), y = cot(x+C). Link software to connect the HP 38G with the PLDL100 Data Logger. Recognize and name the coordinates of points. Graph polar equations and be able to analyze these symbolically and graphically. Plot points in polar form and convert polar coordinates to rectangular coordinates and vice versa. ROM files for use with the Power48 emulator. Includes ROMs for the 48SX, 48GX, and 49G. Investigate the kinematics equations that govern the motion of an object which is fired at an angle with a given velocity. Determine the nature of the roots, predict how many times, if any, the graph of a parabola will cross the x-axis, and find the solution(s). Investigate the effects of changing A, H, and K in the vertex form of a quadratic function. Analyze the effect of these parameters symbolically and graphically. Very well written HP 38G Aplet. This allows students to investigate the behavior of the graph of y=a(x+h)2+v as the values of a, h and v change. This can be done both by manipulating the equation and seeing the change in the graph, and by manipulating the graph and seeing the change in the equation. Investigate rational functions and the asymptotes associated with the function. Reflect graphs of functions about the y-axis, x-axis, origin, and the line y=x. Compute residual values and display their graph as another way to determine how good the regression equation fits the data. Solve right triangles by using the Pythagorean Theorem and the trigonometric ratios sine, cosine, and tangent. Flash update file to update the HP 49G's ROM to version C-1.05. This old version is included in case anyone wants 1.05 for some reason. Flash update file to update the HP 49G's ROM to version C-1.10. This old version is included in case anyone wants 1.10 for some reason. Flash update file to update the HP 49G's ROM to version C-1.16. This old version is included in case anyone wants 1.16 for some reason. Flash update file to update the HP 49G's ROM to version C-1.18. Flash update file to update the HP 49g+'s ROM to version C-1.22. Flash update file to update the HP 49g+'s ROM to version C-1.23, build 31. This is the official 1.23 release. Flash update file to update the HP 49g+'s ROM to version C-2.00, build 50. This is the official 2.00 release. Adds the equation library, much better support for the full 80-line screen, support for FAT32-formatted SD cards, a completely rewritten keyboard handler to reduce the number of missed keystrokes, and many bugfixes. This version is designed to be installed from a FAT16-formatted SD card. Flash update file to update the HP 49g+'s ROM to version C-2.01, build 83. This is an alternate build that changes the behavior of keybounce timing. This is not an official HP release. Flash update file to update the HP 49g+'s ROM to version B-2.01-2, build 80. This is the official 2.01 release. Adds the equation library, much better support for the full 80-line screen, support for FAT32-formatted SD cards, a completely rewritten keyboard handler to reduce the number of missed keystrokes, and many bugfixes. This version is designed to be installed from a FAT16-formatted SD card. Flash update file to update the HP 49g+'s ROM to version B-2.05-4, build 88. Has many changes (listed in the archive), including a return of support for the KEYTIME commands. This is not an official HP release. Flash update file to update the HP 49g+'s ROM to version C-2.06, build 88. Has many changes (listed in the archive). This is not an official HP release. Flash update file to update the ROM of the HP 49g+ and HP 50g to version C-2.09, build 92. This is the official HP release. Flash update file to update the HP 49g+'s ROM to version C-2.00, build 50. This is the official 2.00 release. Adds the equation library, much better support for the full 80-line screen, support for FAT32-formatted SD cards, a completely rewritten keyboard handler to reduce the number of missed keystrokes, and many bugfixes. This is the official HP installer that only runs on 32-bit Windows. The best all-purpose ROM image for the 49/50 series. Includes a version for flashing onto the 49g+/50g, a version for flashing onto the 49G, and a version suitable for using with Emu48. The only difference between this and 2.15 is the lack of StreamSmart 400 support, a long-discontinued product which only works with a physical 50g. Flash update file to update the ROM of the HP 49g+ and HP 50g to version C-2.15. Also includes updates to the equation library and periodic table library. This is the latest official supported release. ROM image from the 48gII/49g+/50g for use with emulators such as Emu48+. ROM image from the HP 39G/40G that can be installed on the 49G to make the 49 act like a 39. If you want to remove this, please read "If it fails" above and then follow the standard ROM update directions. Documentation for RPLComp, the RPL compiler from Goodies Disk 4. RPL Programming Guide from Goodies Disk 4, translated into Spanish and converted to PDF format. RPL Programming Guide from Goodies Disk 4. RPL Programming Guide from Goodies Disk 4 in Adobe Acrobat PDF format. Information on assembly language programming of the HP 48 from Goodies Disk 4. Information on assembly language programming of the HP 48 from Goodies Disk 4. In HTML format. Information on assembly language programming of the HP 48 from Goodies Disk 4. In Adobe Acrobat PDF format. Information on assembly language programming of the HP 48 from Goodies Disk 4, translated to Spanish. DOS programs for use with the HP 48. Includes Kermit, some HP 48 programs, and more. Included with Hewlett Packard's serial interface kit. Documentation for SLoad, the Saturn linker, from Goodies Disk 4. Replaces ALL HP 48G series built-in browsers, the input form engine, the MatrixWriter, and the stack user interface with highly accelerated replacements, like the super fast cmdline/fullscreen editor with interactive Command catalog and parameter help, and more. In version 11.0x, the user can choose between four stack display and editing font sizes. The QuickStartMenu has been enhanced. Support for five (instead of four) input form item lines has been added. But there's much more, like the graphical InputFormBuilder, and Master-Detail capabilities added to the CHOOSE engine, and global access to the MultiClipboard and cmd catalog. For the 48G series only. Please take a look at the SpeedUI walkthrough PDF first. Evaluate expressions when given values for the variables. Explore relationships among the data concerning surface waves. Assembly language stopwatch/chronograph. Doesn't work in a covered port. Assembly language stopwatch/chronograph, ported from the 48. The TEACH command from the 48G series to be used with the HP 49G(+). Available as a library and as a program. Enhanced version of HP's INPRT. Converts graphics strings to grobs. Runs on both the S and G series. Includes source code for the conversion routine. Libraries which translate nearly all system messages and menus into French, Spanish, or Italian. For the G series in an uncovered port. Very well written HP 38G Aplet. This allows students to investigate the behavior of the graph of y=a sin(bx+c)+d as the values of a, b, c and d change. This can be done both by manipulating the equation and seeing the change in the graph, and by manipulating the graph and seeing the change in the equation. Flash update file to update the HP 49G's ROM to the unsupported beta version B-1.19-6. This beta ROM is not supported by HP and is to be used AT YOUR OWN RISK. Also includes emulator ROM update. The above installation directions are not valid with this ROM, so please read the included 49.html before installing because you will need to back up the 64KB bank of flash memory. The USAG (usage) application enables you to review the stack argument object type usage for any command built into the calculator or any library command. Library creation program for MS-DOS included in several SDK's, including HP Tools and the HP 48 Software Development Tools. Documentation for UsrLib, the library creator from Goodies Disk 4. Has a lot of useful information on creating libraries that's applicable for other library creators, too. Library creation program originally written for MS-DOS, ported to the Amiga. Has the various utility functions included in the Equation Library card. For the S series only. Calculate volumes and surface areas for the three dimensional shapes of the pyramid and the cone. Calculate volumes and surface areas for three dimensional shapes of the box and the cylinder. A high speed Xmodem server for HP-48. Included in the Conn4x package. Server also works with the HP-49G Xmodem Connectivity Kit 1.x.